What’s better than sitting around a crackling fire with your friends on a cool summer night? Sharing this experience at your own fire pit! This time of year, it’s great for outdoor entertaining since it provides a little extra warmth on nights when the temperature dips down while keeping the bugs at bay. Once you add this feature to your property, though, you become responsible for the ongoing maintenance. So, try to remember these tips throughout summer. Honestly, where you place the fire pit initially will determine not only how safe it is use after use, but also how much maintenance it requires. As a basic precaution, you should install your fire pit (a minimum of) 10 feet from any other structure. This includes decks, fences, porches, patios, sheds, etc. Moreover, you should keep the area around the pit cleared of debris within that same 10-foot radius. Doing so will reduce the chance of flames spreading to other parts of your property, as well as keep unsafe items from accidentally drifting within range of the fire. Pay special attention to overhanging items like awnings or even trees. These can be hazardous in dry conditions and/or cause falling debris to ruin your carefully constructed fire pit. Ideally, you’ll find a place on the property that meets these requirements and is partially sheltered from the wind, so you won’t have to worry as much about drifting smoke and ash. What you burn can make a big difference when it comes to both safety and cleanliness. For wood-burning fire pits, obviously wood is the best material to use. Specifically, you want to place dry, split wood inside that will burn cleanly. Wet or green wood doesn’t burn as well and/or can create a lot of smoke. Experts recommend using leaves or twigs from your yard to start the fire, rather than trash or accelerants. Unfortunately, you don’t always know what chemicals are in common household items or pressure-treated wood. If burnt, these chemicals can be released into the air, creating a toxic atmosphere that can endanger your health—not to mention ruin your party. 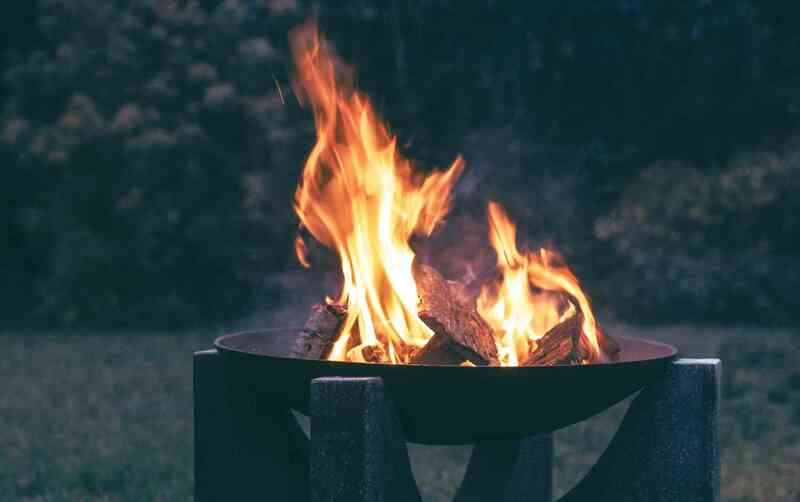 Adding lighter fluid to the equation can further damage or discolor your fire pit, requiring repairs or even a full replacement. Regardless of what kind you ultimately get, you’re going to find yourself removing ash fairly frequently—at least if you plan on using it. Ashes are acidic, so allowing them to sit in your fire pit will damage it. Too many layers of ash also make putting the fire out (completely) more difficult, so they become a safety hazard. Fortunately, you can shovel these out fairly easily, as long as you don’t let them build up too much. You can even keep a metal trashcan on hand to remove them after each fire, if you prefer. A fire pit can be a great addition to your outdoor entertaining space! Just try to take some basic precautions—like keeping it far away from your new deck and/or fence—and you’ll be able to enjoy it for many summers to come. This entry was posted on Friday, June 8th, 2018	at 3:03 pm	. Both comments and pings are currently closed.